Brand : TreeWool Box Contains : 2 Piece Cushion Cover / Shell only. Cushions are not included. These products are carefully hand finished to give you a superior quality Cushion Cover that is sure to add charm to your living room, lounge or bedroom. Product Features : 1. Each unit is made with high quality 100% cotton canvas to increase durablity 2. 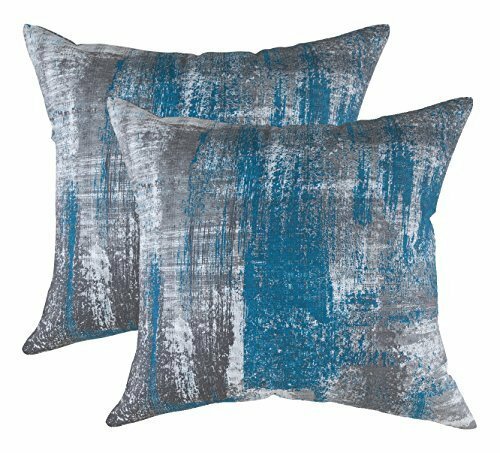 Each Throw Pillow Cushion Cover has the same design on both sides 3. Each unit has a high quality hidden / concealed zipper, that allows for easy insertion and removal of Pillow Inserts 4. In the inside, all fabric edges are stitched with overlock stiches to avoid fray and increase durability of cushion covers 5. These throw pillow cases are suitable for use in sofa / Couch beds 6. Fully machine washable. To increase the life of your cushion covers, we recommend following the care instructions provided in the label. About TreeWool : At TreeWool, we are passionate about providing premium quality products at affordable price for every household. As much as we care about the quality of our products, we are also equally passionate about providing all our customers a great buying experience. We bring our expertise in Home Fashion sector in Europe to the US. You can buy our products with confidence.